Properties in Pyrénées-Atlantiques average 4.5 out of 5 stars. 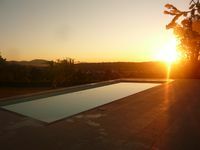 Property 3: RENT furnished accommodation for holidaymakers or elegant detached villa spa guests. Property 25: Beautiful and Spacious 4 Bedroom Villa with Private Swimming Pool and Garden. Property 40: Sunday to Sunday. RARE and CALM. Luxury villa ranked 3 *** ocean view. Property 47: villa with large garden terrace. We were a group of 15 friends from mostly the USA. This house was perfect for our needs. We vacation together most summers, and of all the houses we have rented this one had the best kitchen and cookware. There was even a sharp knife, unheard of in most house rentals. The pool was warm, the walking-distance town, Ascain, was charming and had a good bakery. There is a large table on the covered porch we used for all meals, rain or shine. Highly recommended.